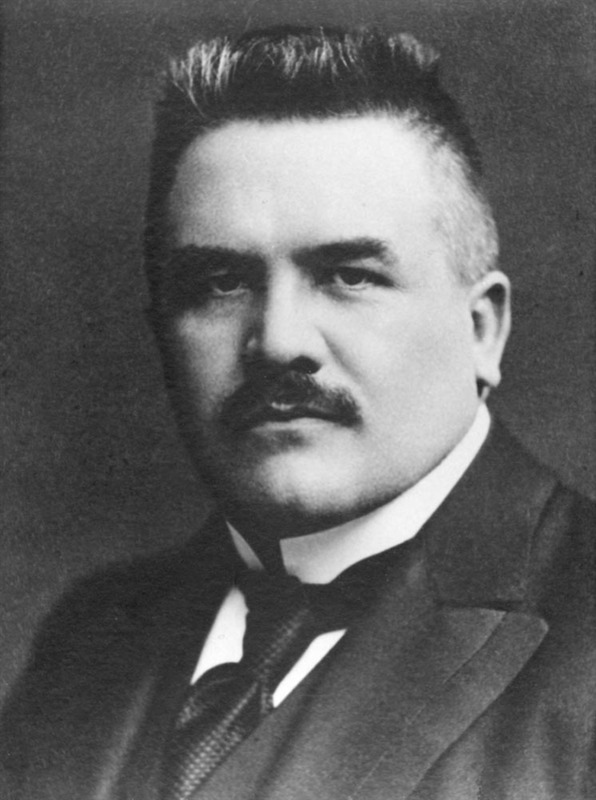 Demartini was the fat head of the guards for the prisoners in custody at the Zemský trestní soud. The prison guard has perhaps been inspired by the very real police high commisioner in Prague, Rudolf Demartini (1866-1919), who lived in Královské Vinohrady (1906). This is a person Jaroslav Hašek surely knew or knew about. Little is known about him except for that he had three daughters and is buried at Olšany in Žižkov. It has not been confirmed if he really was the chief guard in the remand arrest at Zemský trestní soud in 1914. He is not listed as an employee of the criminal court in the address books of 1907 and 1912 and it seems strange that someone with such a high rank is employed as the head of the prison guards. Therefore this is probably a borrowed name and not much more. Valeš was a well knwn murderer who some years earlier had been interrogated by the same good-natured man who questioned Švejk at Zemský trestní soud. 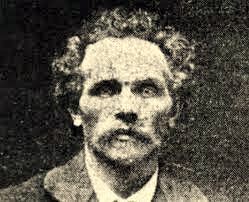 Valeš and his wife Ludmila committed a brutal double murder in April 1902 in the villa "Vilém" in Horní Krč where he was employed as a gardener. The victims were the young Slovak/Hungarian couple Matilda Hanzely and József Takács. They were planning to emigrate to America and therefore had a lot of money handy. Valeš hid the corpses in the garden and the crime was not discovered until October 1904. In February 1905 the couple was sentenced to death but the term was converted to life imprisonment by Franz Joseph I.
Amongst those who interrogated Valeš in 1905 were Karel Křikava and Václav Olič. They were police officers that Jaroslav Hašek knew and one of them may well have served as models for the good-natured interrogator. E.E. Kisch mentions the Valeš-case briefly in the story Polizeimuseum, where he reveals that the murderer's weapon is on exhibition. At the time of the discovery of the murder the owner of the villa was Alois Bauer, a merchant who lived in Smíchov. When the trial took place (January 1905) he was under administration and the villa was sold. In 1909 he committed suicide by jumping into the Vltava near Střelecký ostrov. Aus Prager Nächten und Gassen (Polizeimuseum): Eine ganze Vitrine weist die Instrumente auf, mit denen das wurdige Ehepaar Valeš zu Krtsch das Liebespaar Takasz-Hanzely im Schlafe umgebracht hatte: ein Jagdgewehr, ein Strick, ein Revolver, ein Beil. Pontius Pilate is written about by the author when he describes those of the examining magistrates who were most obsessed with the letter of the law as "the Pilates of the new era". Pontius Pilate was Roman prefect of Judea in the period 26 to 36 AD and oviously plays a central part in the Bible as the Roman official who sentenced Jesus to death by crucifixion. [1.3] Vracela se slavná historie římského panství nad Jerusalemem. Vězně vyváděli i představovali je před Piláty roku 1914tého dolů do přízemku. A vyšetřující soudcové, Piláti nové doby, místo aby si čestně myli ruce, posílali si pro papriku a plzeňské pivo k Teissigovi a odevzdávali nové a nové žaloby na státní návladnictví. Prokop Švejk is here at Zemský trestní soud mentioned in passing by Švejk when referring to his parents. They are mentioned again in [II.5], and it is only then their full names are revealed and it transpires that they are from Dražov. [2.5] Jakmile jsem ho poznal, šel jsem k němu na plošinu a dal jsem se s ním do hovoru, že jsme oba z Dražova. On se ale na mne rozkřik, abych ho neobtěžoval, že prý mne nezná. Já jsem mu to začal vysvětlovat, aby se jen upamatoval, že jsem jako malej hoch k němu chodil s matkou, která se jmenovala Antonie, otec že se jmenoval Prokop a byl šafářem. Ani potom nechtěl nic vědět o tom, že se známe. Tak jsem mu ještě řekl bližší podrobnosti, že v Dražově byli dva Novotní, Tonda a Josef. Antonie Švejková is mentioned in passing by Švejk when referring to his parents in a conversation at Zemský trestní soud. The parents are mentioned again in [II.5], and it is only then their full names are revealed and it transpires that they are from Dražov. [2.5] Jakmile jsem ho poznal, šel jsem k němu na plošinu a dal jsem se s ním do hovoru, že jsme oba z Dražova. On se ale na mne rozkřik, abych ho neobtěžoval, že prý mne nezná. Já jsem mu to začal vysvětlovat, aby se jen upamatoval, že jsem jako malej hoch k němu chodil s matkou, která se jmenovala Antonie, otec že se jmenoval Prokop a byl šafářem. Heveroch was mentioned in a story by one of Švejk's fellow detainees who had gone to a lecture by Heveroch to learn to fake madness. He drank from the ink pot and performed his bodily needs in front of the legal commission. The only mistake he made was to bite a psychiatrist in the right foot, a procedure which was not described by Dr. Heveroch. One of the doctors of the commission that examined Švejk was a follower of Dr. Heveroch's psychiatric teaching. Heveroch was a notable Czech psychiatrist and neurologist who was, amongst other things, known for his studies on dyslexia and epilepsy. His book „O podivínech a lidech nápadných“ (On Freaks and Striking People) (1901) was according to František Langer amongsts Jaroslav Hašek's favourites. [1.3] „Já těm soudním lékařům nic nevěřím,“ poznamenal muž inteligentního vzezření. „Když jsem jednou padělal směnky, pro všechen případ chodil jsem na přednášky k doktoru Heverochovi, a když mě chytili, simuloval jsem paralytika právě tak, jak ho vyličoval pan doktor Heveroch. Rotter in the middle. Svět Zvířat, 1909. Rotter was a well known police chief in Kladno who trained his dogs by experimenting with them on tramps in the district. This is according to a story Švejk tells his fellow prisoners at Zemský trestní soud. The policeman is mentioned again in [II.2] during Švejk's wanderings around Písek. This story is almost identical, but is now told by a tramp. Rotter was a renowned dog breeder and policeman, stationed in Kladno at least until mid-summer 1914 and then Písek. Here he was head of the 14th gendarmerie department. He specialised in police dogs and was a member of the Polizeihundverein (Police dog association). In 1911 he published the 107 page booklet Anleitung zur Dressur von Polizeihunden. Jaroslav Hašek knew him personally from his time as editor of the magazine "Svět zvířat" (Animal World), and on 28 June 1914 (the day of the muder of Franz Ferdinand), he and Josef Lada visited Rotter in Kladno. In 1909, when he was still Oberleutnant at K.u.k. Gendarmerie in Kladno, Rotter bought two German Shepherds from Saarbrücken, where had had been on a course the previous year. He trained the dogs Wolf and Wölfin for service purposes and in Svět Zvířat appeared a picture of the latter "catching" a runaway. Rotter later wrote several books on the subject of dog breeding. One of them was published as late as 1947, three years after his death. [1.3] Taky vám dám příklad, jak se na Kladně zmejlil jeden policejní pes, vlčák toho známého rytmistra Rottera. Rytmistr Rotter pěstoval ty psy a dělal pokusy s vandráky, až se Kladensku počali všichni vandráci vyhejbat. Wölfin (Vlčka) was most probably the name of the police dog that is mentioned in connection with Rotter's experiments in Kladno where he lets police dogs chase tramps. In the novel the dog is referred to as a police dog and wolf-dog. Wölfin was a female police dog that Rotter reportedly brought in from Saarbrücken together with the male Wolf in 1909. It was probably one of those dogs Švejk had in mind when he told his anecdote. The author knew Rotter well and had surely been aware of and seen both dogs. Wölfin was moreover bred at the kennel of Fuchs a Klamovka, next to the villa where Svět zvířat had their editorial offices and where Jaroslav Hašek worked as an editor. He would therefore have known the female dog well and in an article in the magazine 1 November 1909 it is stated that her training took place here at Klamovka. On 16 October 1909 Rotter showed off the skills of Wölfin and a Doberman Pinscher called Petar on the premises of Policejní ředitelství. The whole leadership of police HQ was present, amongst them commissioners Drašner and Ladislav Adamička (the brother of captain Adamička). The article also states that Wölfin was bought from the kennel at Klamovka earlier in the year. Kallerson is mentioned together with the psychiatrists Heveroch and Weiking as someone who had founded a school within the discipline. Kallerson was a psychiatrist but there is no information available apart from what is stated in the novel. Břetislav Hůla is of the opinion that the name is invented as he was unable to verify the existence of any well known psychiatrist Kallerson. [1.3] Věc byla úplně jasnou. Spontánním projevem Švejkovým odpadla celá řada otázek a zůstaly jen některé nejdůležitější, aby s odpovědí potvrzeno bylo prvé mínění o Švejkovi na základě systému doktora psychiatrie Kallersona, doktora Heverocha i Angličana Weikinga. Weiking is an Englishman mentioned together with the psychiatrists Heveroch and Kallerson as someone who had founded a certain school within the discipline of psychiatry. Weiking is supposed to have been an English psychiatrist but there is no information available apart from what is stated in the novel. The name doesn't sound partucularly English. Břetislav Hůla assumes that the names Kallerson and Weiking are inventions.